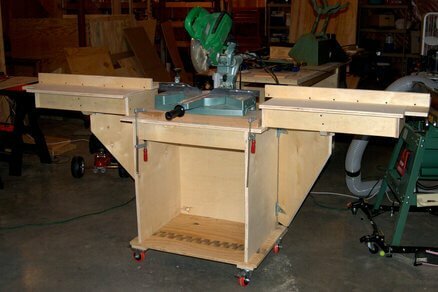 Building your own miter saw table. Sometimes having a good miter saw work stand can be just as important as having a high quality saw when you’re doing woodworking or carpentry projects. This project will show you how to make a saw table fit to handle anything you plan to do with your miter saw. 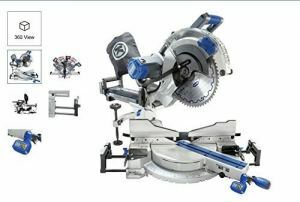 The table features extended wings on both sides of the saw that allow you to cut long pieces of wood without any trouble securing it in place. Your saw is easily removable if you want to take it on the go with you, although it fits securely in place on the table while you’re working. Simply mount it onto the plywood base so that the saw is aligned with the fence and you are set to start working. Sawdust management is accomplished by a built-in shop vac with a hose leading to the work area as well as a dust collection box underneath the work surface. Almost all the sawdust is caught by this combination, making it easier to focus on your work instead of the cleanup. Overall this table can be a great help to you as you’re working, both by holding everything you might need as well as assisting you to make the most accurate cuts possible even on longer boards. The design featured here should be compatible with many compound miter saws. Dimensions noted are for a particular miter saw that measures 17” x 25” x 4 3/8”. 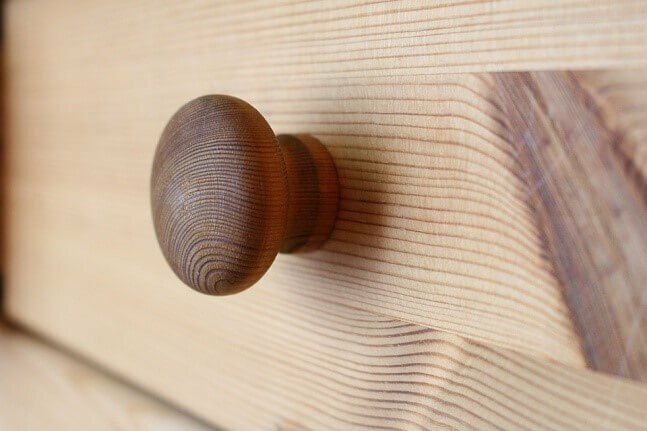 You can easily alter the measurements to fit your own saw by changing the width of the drawer boxes on either side to make them wider or narrower where necessary for a good fit. The height can be adjusted by cutting the support boxes underneath the saw thicker or thinner. Most likely you will not have to adjust the height of the table though, as most saw heights should fit in the standard space easily. If you need to adjust the depth you can do so by changing the depth of the dust collection hood behind the saw. 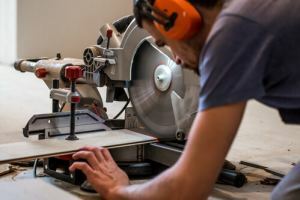 You also may have to adjust the depth of the cabinets, drawers, and dust hood if you have a sliding compound miter saw that you plan to use with this table. 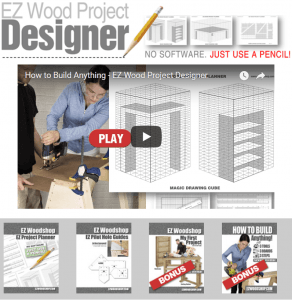 Without some of the additional features you can trim down on the cost of making this table. The regular version costs around $500, but without some of the extras you can make it for about $200 instead. These costs don’t include the miter saw or the shop vac. Most of the cheaper changes include less expensive plywood, excluding the built-in tool actuated switch, and getting rid of the drawers, dust hood, and cabinet doors. 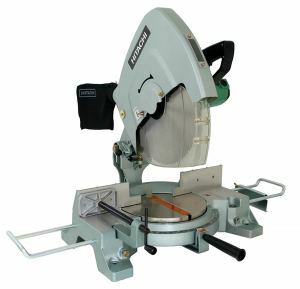 While it doesn’t have exactly the same functions, the cheaper version is still a very well designed mobile miter saw table. To set up and use the table you will need a shop vac and a compound miter saw. These are not included on the list, as they are not necessary to make the table but will be necessary to use it properly. Shelf 1 Plywood ¾” x 19” x 19 3/8” Edge-band on front edge. This saw work stand is made in a series of phases. There are 7 phases that focus on making different parts of the table before it is all combined together. Although there are different phases listed below, there will be easy to follow steps number 1 through 30. This should make it simple for you to follow along and complete the saw on your own time without losing track of the directions! Measure your miter saw in order to find out what the dimensions of the saw stand’s well should be. If the saw is larger or smaller than what is mentioned on the list of cuts above, adjust the size of the cabinet as needed. Cut all of the pieces of plywood as they should be sized. Cut 1/4” strips of solid wood. This will be banding for the edge of the side of the boxes. Glue the banding on. Take the dados and rabbets and cut them for boxes and cabinets. As you’re cutting, remember that the box’s top overhands its sides to give clearance to allow the prop of the wing to fold against the side of the cabinet. Take all the cut pieces and assemble the boxes and cabinets. To finish the boxes you should glue the screw spacers on to the boxes. These spacers are used inside the drawer to bring the face frame in tightly. Face frame will be attached to the drawer later. Glue wing pieces together for double thickness on both sides of the table. Place the glued pieces together on the table saw top and trim to their final size. Make sure to clamp them down with cinder blocks or an F clamp before you make the cuts. Cut solid wood strips to make bands for the wings, doors, drawer faces, saw platform, shelf, dust hood sides, and dust hood top. Once you have cut the bands, glue them on to their respective parts. Cut the props for the wings. Make hinge spacers by gluing the necessary materials together. Cut again until they are at their final sizes before screwing and gluing them to the side boxes. Take the continuous hinge and cut it into four different 14” lengths. Turn boxes upside down onto a flat surface and attach the hinge spacers to the wing spacers flush with the back of each box. Attach each upper box to the cabinet with screws. Take out your drill and make two holes in the back of the shop vac storage compartment. One hole should be large enough for the vacuum hose while the other should be for the power strip cord. Drill another hole into the well for the miter saw’s power cord. Attach the casters to properly sized blocks and screw and glue these to the cabinet. Take out solid wood strips and cut them for the face frame. Frame should then be assembled using pocket screws, dowels, or biscuits of your choice. Once the face frame is complete, glue it to the box and cabinet assembly. Bring the glue block and install them behind the wing covers in their final location. Clamp on the wings so that they become level with the tops of the boxes before attaching the props to the cabinet. There should be about 1/2” of clearance only between the prop tops and the wing bottoms, nothing more or less. You will need to make a ramp-shaped prop stop to fit your wings properly. To do this, measure the gap that is between the existing props and the wings on each side. Make the ramp according to these measurements and attach the stops. Check the cut list of the sizes of the rabbets on the drawer and dust hood sides. Assemble the dust hood once you have made these cuts. Bring out the aluminum angle stock and cut two brackets of the right sizes. Use a drill to make holes in each bracket. Bring out your hacksaw and cut one notch in the left side bracket to allow the hood to rotate outwards for easy cleaning later on. Take the brackets and screw them on to your assembled dust hood. Put the dust hood in the position it will be in on your completed table and mark where the hanger bolts will go on the box tops. Drill in the marks and insert your hanger bolts accordingly. Drawers should now be assembled with the pieces you have already made separately. Make sure to attach the drawer guides to both the drawers and the boxes as well. 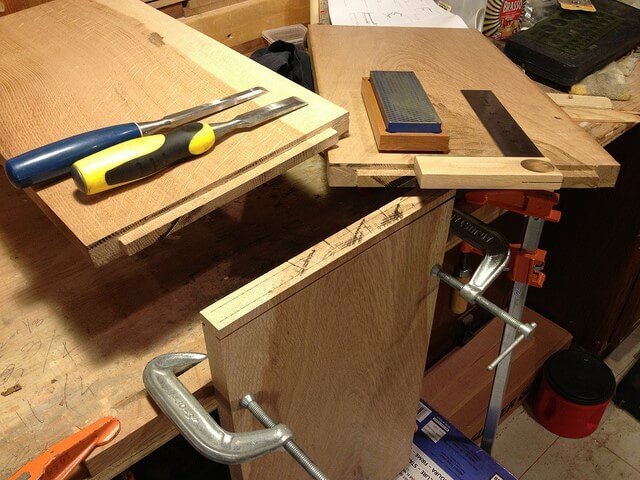 Using your dado set, cut notches in the sides of the saw platform. These notches will be for index blocks as well as the power cord. Put the platform in position on top of the cabinet. You should notice that the platform is about 1/4” shorter than the space that is between the drawer boxes. That is how it should be, as you will need that space to remove the platform and saw more easily. Take out your miter saw and place it on the platform before measuring from the miter saw’s table to the box tops. Rip or plane the spacers of the two heights. Each one’s thickness should equal the distance. Attach these spacers under the saw platform. If the spacers need adjustment you should either remove more of the wood or else add shims. The saw table should stand exactly level with the boxes on either side of it. Once you have gotten the right heights, remove your saw and platform and attach the spacers to the cabinets. Put the platform back into place. Center the saw platform perfectly into place and cut separate index blocks to fit into the platform’s notches tightly. If you want to make it easier to install the platform, bevel the block tops before screwing them onto the spacers (while the platform is in its place). Put the saw square onto the platform and attach it there. Make slots on the bases of the fences and wings by drilling small 1/4” holes at the ends of each before routing between the holes. Make notches on the base of the box fence to fit around the dust hood brackets that are already attached to the table. Cut biscuit slots (#20) into the fences faces and the bases. Glue the fences together, making sure that each one is squared to the base. Take the Top Trak and cut it to the length of each of the fences you have made. Attach the pieces to the top of the fence faces by drilling holes into the Top Trak and using the provided screws to firmly attach it. Choose a piece of scrap 3/4” board and clamp it to the saw fence. Place a 3’ long straightedge against the wood. Slide the box fence up until it is also against the straightedge. 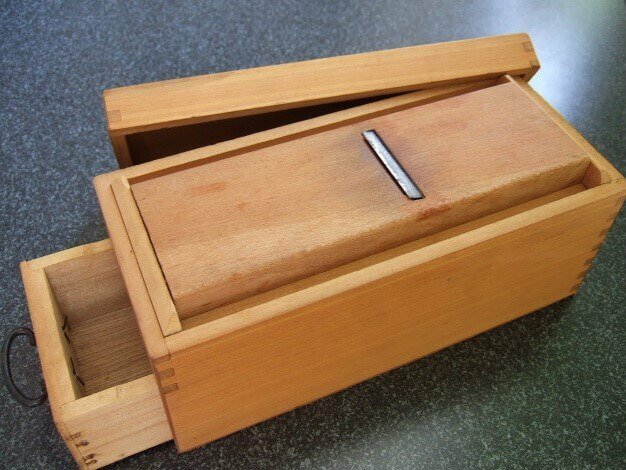 Using a drill, make 1/4” diameter holes in the box top of the box near the slot’s rear. Remove the fence piece and drill the holes again to be 5/16” diameter before installing the T nuts into the drilled holes. Cut a 1/4” x 3” all thread rod into two pieces. Each should be long enough to have about 1 1/2” of thread showing out of the knobs. 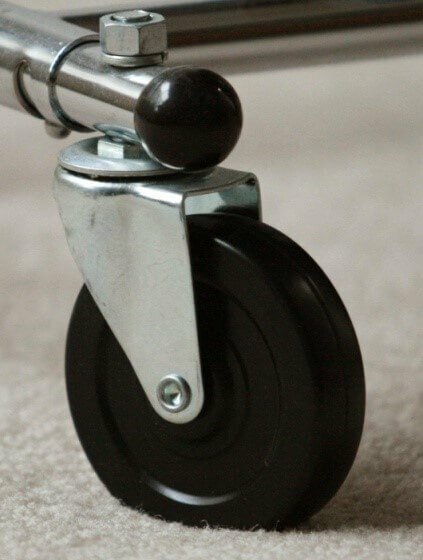 Glue the rods to the knobs with a strong adhesive such as epoxy. Position the box fence against the straightedge again and fasten it with the knobs you have just made. Raise and prop the wings so they are well supported. Align the fences on the wings and boxes with a straightedge. Repeat the process in step 23, but on the wings near the rear slots. You should end up with the T-nuts installed here as well. Cut new all thread pieces. These two should both have about 2 1/4” sticking out of the knobs before the rods are glued into the knobs. Use in knobs as a clamp for the fence. This step should be done for both wings, one at a time. At this point all the fences on the table should be clamped to be even with the scrap board. Drill 1/4” holes that will be used for locating pins to index the fences. Drill each hole through the fence and about 1” into both the wings and boxes. Take away the scrap board from the miter saw table and positions the fences so they will now be even with the new table fence position. Clamp them in place and drill locator pin holes into the wings and boxes again in the new position. Put the locating pins into the holes as needed. You will be making the door to fully overlay the openings. This style will work best to seal the dust away from the interior of the table. Attach the hinges to the cabinet and doors and install all the door pulls and magnetic catches to the proper areas. Make sure the doors shut securely. Take the drawer faces and attach them to the boxes. Sand the table and finish as you desire. 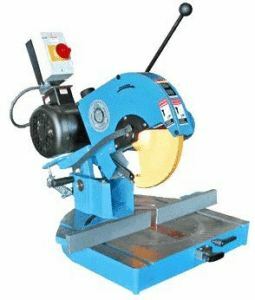 Now that your mobile miter saw work table is completed, you can immediately get to work on any other woodworking projects you have ahead of you. Simply mount your saw onto the saw platform, plug it in to the tool-actuating power strip, and go! 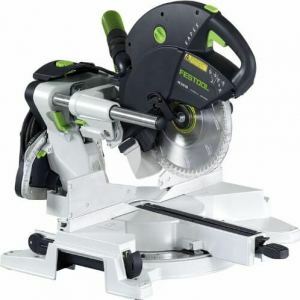 You should find that the table is perfectly set up to help you easily clamp and cut any type of wood you will be needing to cut with your compound miter saw. For longer pieces of wood you can prop the wings and have a much longer fence to work with the make sure your cuts end up perfectly uniform. This saw stand will last you for many years and will probably become your new favorite place to be when a project needs to be done!